The Active Points Count of the selected 3D model. 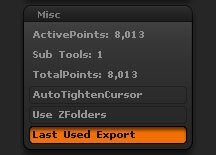 The Subtools Count of the selected 3D model. The Total Points Count of the selected 3D model. Automatically select the last used file type when exporting.